ESCONDIDO -- When the favorites are away, the others will play. 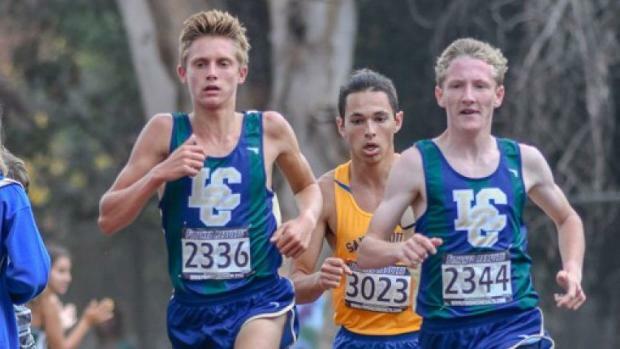 That's the way it went in the Bronco Roundup Saturday at Kit Carson Park when La Costa Canyon's Kristin Fahy and Garrett Stanford didn't compete for entirely different reasons, opening the door for others running the 2-mile course in the early-season meet. 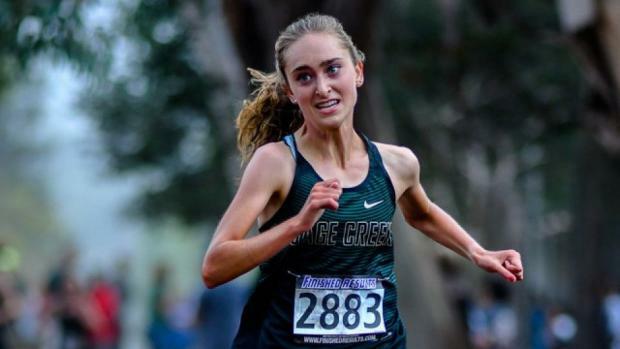 The story here was La Costa Canyon's Fahy, who missed the meet while on a recruiting trip to visit Georgetown (where her brother Darren graduated). She will take another visit later this season to Stanford (where her other brother Steven attends). That left the race wide open, so Sage Creek junior Skyler Wallace and her freshman sister, Stormy, made a lot of noise with Skyler out-dueling LCC's Jessica Riedman for the title in 11:27.4-11:34.6 with Stormy right behind at 11:37.6. "(Fahy) is amazing, she's probably saving what she has for the bigger races," said Skyler, unaware that Fahy was making a recruiting visit. "This is my home course. Over the summer I practiced on a crazy hard mountain in Flagstaff that was six miles straight up. So, I decided to use that experience and attack the hills here. That's when I passed Jessica." The move came with about three-quarters of a mile to go at the top of the only big hill on the course and Riedman admitted she was surprised, especially when Stormy went by a little later. Blame it on the uniqueness of leading. "I've never led a race," said Riedman, the section 800-meter champion who has run in the shadow of the graduated McKenna Brown (now at Cal) and Fahy. "I'm not used to being up there by myself. I didn't know where the pack was and when Skyler went by, I wasn't sure if I should go or wait. "It was a weird feeling but when her sister went by me with 800 to go, I thought to myself 'wow that was dumb of me (to let both go by)', so I ran down Stormy but Skyler was too far ahead. I guess I'm better chasing people, but it was an awesome feeling to lead, too." There was one more hazard she hadn't experienced...huge potholes. "Those were ankle-breakers and I didn't need that," Riedman said. "When you're not the leader you just follow the others who are avoiding them." On this day Skyler Wallace was pretty much in control, especially with her sister there. "I'm happy to have my sister here to push me (in practice)," said Skyler. "She pushes me, too," said Stormy, who is a couple of inches shorter but the spitting image of her sister. Coach Jacob Fiering says he knew Skylar was ready but not to win the race. "That surprised me," said Fiering. "She won a varsity race at Woodbridge a year ago but this was bigger. Having her sister on the team helps us a lot. They thrive and push each other and get along so well." Jacob and Garrett Stanford are identical twins and their times in virtually every race are usually less than a second apart. With Garrett cheering on his brother after feeling pain in his instep recently, one wondered how Jacob would fare. With San Pasqual's Franky Varela and new teammate Caleb Niednagel providing the push (Clark Kranz photo), Jacob powered his way to the victory in 9:43.5 -- the fourth fastest time ever over the Bronco Roundup course. Right behind were Varela at 9:44.4 (No. 5) and Niednagel at 9:46.0 (equal to No. 7 all-time). Jacob said he knew that Varela already had two races under his belt -- both wins -- but wanted to make it two in a row for the Stanford twins after Garrett won last year. "Caleb was right there with us and we actually used each other tactically by having whoever was on the inside at the turn take the lead," explained Jacob. "I kept my head down because I wanted to see what I could do." On the plus side, Jacob said not only did he collect the victory, but he finished the race with plenty to spare compared to last year when he admitted he was exhausted. Niednagel is pretty much learning the ropes after running at Dana Hills the last two years and asked to compare Dana Hills and LCC's programs, he demurred, saying each was outstanding but admittedly different. "I'm looking forward to seeing them next week (at the Mt. Carmel Invitational)," he said. With the meet broken into the power programs and those working their way back to that status, Grossmont High in La Mesa took full advantage, producing both the boys and girls individual champions. Sophomore Madeline Minutelli used the strategy Riedman usually employs, hanging on to whoever wanted to lead and pushing the hills, which she loves. After the mile the runners approach the steeper of the two hills and from the strength she gained running her home course at Harry Griffin Park, she surged and no one could stay with her. "This is amazing," said Minutelli who placed 13th in a junior varsity race a year earlier when she ran 15:03-more that two and half minutes slower. Minutelli suffered a stress fracture and an injured hip after track and didn't even get back to road training until July but appeared totally in control in the race which was run in the direct sunlight compared to fog helping keep the temperatures down in the Division I races. Jonathan Rodriguez-Gomez was born and raised just across the border in Tijuana but when he was 10, the family moved north. The senior not only won the Division II race by six seconds in 10:10.4, he led the Foothillers to the team title by three points over San Dieguito Academy. He went out for cross country as a sophomore and last year finished seventh in this event in 10:31. He was ready to roll Saturday after a high-mileage summer. "I could have run under 10 minutes if I had someone to push me," said Rodriguez-Gomez who noted that he and his teammates probably wouldn't have won in Division I so decided Division II was just fine. "I prefer longer races and I was just running on pace. I didn't even look at my time at the finish line but I'm real proud of my team."